150 years ago, when traveling through western and southern Minnesota, you would have seen a landscape filled with native wildflowers, grasses and dancing butterflies as far as the eye could see. If you can imagine, one-third of Minnesota was once covered in tall-grass prairies, an essential habitat for many species of butterflies, as well as other insects, birds, and wildlife. Today, only 1% of Minnesota's prairies remain mainly due to agricultural and housing developments. People have recently become more aware of the importance of planting prairie flowers to help support our butterflies and other pollinators, but most people are still unaware of the importance of growing native grasses to support native butterflies. Native grasses are essential larval (caterpillar) host plants for many species of prairie dependent butterflies. The larva feed on the grass, use it to build their shelter, it protects them from predators, and adult female butterflies will seek out specific host plant habitats to lay their eggs on or near. Overall, native grass host plants play an integral role to the survival of many prairie butterfly populations. As a result to habitat loss, there are currently 12 species of prairie dependent lepidoptera (butterflies and moths) on the MN Department of Natural Resources endangered, threatened, and special concern list. By incorporating more native grasses into our rural, suburb, and urban landscapes, we can potentially relieve some of these habitat loss pressures to support our native butterflies. A wonderful grass to start with is little bluestem (Schizachyrium scoparium). Little bluestem is a very hardy MN native prairie grass that has been documented to support several species of prairie butterflies such as the once common Dakota skipper (Hesperia dacotae) and Ottoe skipper (Hesperia ottoe). The Dakota skipper butterfly was historically found in 40 MN counties but is now found in only 11 counties and is listed as an endangered species statewide. Dakota skipper male butterflies have brown- orange wings with darker markings The adult females have been found to lay their eggs on or near little bluestem. Although the larva will feed on a variety of different grasses, they tend to have better success in building their shelters in smaller bunchgrasses such as little bluestem. The Dakota skipper has so far only been spotted in native prairie habitats, which may suggest that fragmented land such as urban settings may be a barrier for this species. The Ottoe skipper is also currently listed as an endangered species statewide although it was once a common butterfly before extreme habitat loss. The male butterflies are a golden orange color and are very strong, fast flyers. Similar to the Dakota skipper, this butterfly is a grass generalist as it will feed on a variety of grasses but prefers the structure of little bluestem for constructing a shelter. Additional Minnesota butterflies that have been documented as using little bluestem as a larval host plant include the Cobweb skipper (Hesperia metea), Dusted skipper (Atrytonopsis hianna), Swarthy skipper (Nastra Iherminier), Indian skipper (Hesperia sassacus) and the Leonard's skipper (Hesperia leonardus) a special concern species. Little bluestem is a warm season mid-height native grass, common to Minnesota prairies. It reaches an average height of 3' with arching foliage and a clumping habit. This native perennial gets its common name from the blue stem color it develops over the summer. 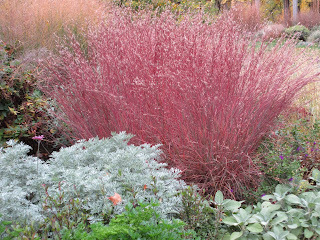 In the fall, the little bluestem turns a beautiful bronze-red color. Little bluestem is a very hardy and low maintenance grass. It is capable of growing on a wide range of soil types from mesic to dry and infertile soils but overall does best in well-drained areas. Little bluestem is a very drought tolerant grass needing no irrigation once established and can be grown in areas with full to partial sun. It has no known pests and therefore requires no pesticides or insecticides. Like many other native grasses, little bluestem provides several ecological benefits. The deep fibrous roots it develops helps to hold soil in place and reduce soil erosion and run off. Also the annual renewal of its root system increases soil organic matter and the bunch grass form provides habitat and food for prairie songbirds, as well as many native butterflies. Seen as both an ornamental gem and an environmentally sustainable plant to many horticulturalist, little bluestem can bring beauty and ecological benefits to many landscapes. This hardy low maintenance grass provides food and shelter to many species of insects, birds, and animals, helps to reduce soil erosion and increases soil fertility. By planting more native grasses, such as the little bluestem, into our landscapes, we can begin rebuilding the crucial prairie habitats we have so drastically lost. A friend of mine who lives within the bounds of a State Park in southeastern MN said that he's seen far fewer butterflies this year. Has anyone else noticed? If so, what could be the reason, particularly this year? Thanks for any comment! We have just started to see monarchs on our milkweed this week. But yes, fewer butterflies sighted this season. No cats on my dillweed either :?